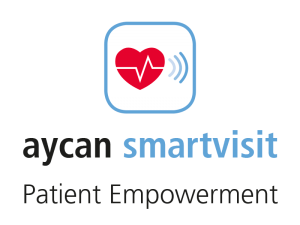 aycan smartvisit enables patients to assume a more active role in thier treatment, and stay actively involved with thier care network (physicians, nursing teams, home caregivers, family members). Studies show that when patients share their health information, they receive better support, and their overall treatment and quality of it is improved. Using an Apple iOS device (iPhone, iPad, etc. ), patients manually enter data into the aycan smartvisit app, which also collects and stores data from their medical wearables1. Patients can then monitor their data and securely share it—only the patient can decide what data they want to share, and when and with whom they share it. When the patient shares their data, its encrypted and transmitted (without storage on the Internet!) to a secure server where it’s stored and encrypted according to the latest security standards, and can only be opened via special interfaces and programs. With aycan smartvisit, patient data is secured in accordance with strict data protection laws.